Hyaluronic acid is a naturally occurring molecule in the skin, which has unique capabilities in retaining water. Youthful skin retains its elasticity and tone due to its high content of water. On the other hand, skin ageing is associated with loss of skin moisture. Reintroducing hyaluronic acid to the skin, which binds and retains water molecules, can, therefore, increase the moisture in the skin, helping to restore its youthful appearance and reverse the ageing process. Which areas can be treated with mesotherapy? Mesotherapy is most frequently performed on the face and neck, but it can also be used for a treatment of the décolletage and hands – two areas which often experience increased sun exposure and subsequent premature ageing. Mesotherapy can be used to treat the entire face or target specific problem areas, such as encouraging rejuvenation of the eye area. The treatment is safe for all skin types. At Ocean Clinic Marbella the hyaluronic acid filler we use for this treatment is RestylaneSkinboosters. 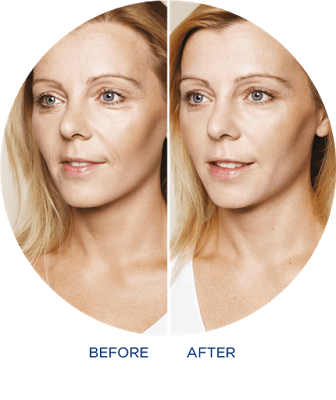 This product is specifically designed for facial mesotherapy and is softer than the Restylane dermal fillers used for restoring volume to the lips or to fill in wrinkles. By placing small amounts of hyaluronic acid across multiple sites it helps to rehydrate the entire skin, having a noticeable plumping effect. Once injected, the water-loving hyaluronic acid molecules start to swell with water, absorbing up to 200 times their weight. By boosting hydration levels deep inside the skin, the Skinboosters improve the overall quality of the skin, increasing its smoothness, elasticity and firmness. It also provides a truly moisturised glow. What’s more, Restylane Skinboosters help to kick-start collagen production giving long-term, anti-aging effects. Restylane Skinboosters is administered over a course of three treatments, each approximately four weeks apart (one appointment monthly). Subsequent treatments are done every six months. Improvements to skin tone and texture will be visible immediately and continue to develop throughout treatment. Mesotherapy can also be used alongside conventional dermal fillers to achieve an enhanced result. There may be some superficial swelling, bruising and pinprick marks after treatment. Temporary bumpiness may also occur. The amount of time these side effects take to subside will depend on the sensitivity of the skin and area treated, but in most patients, it will have resolved within 24-48-hours. Patients can usually return to work the following day, but treatment should be avoided directly ahead of important events. Ocean Clinic Marbella is one of the most modern clinics on the Costa del Sol, offering a complete range of surgical and non-surgical cosmetic treatments and dentistry. The clinic was founded in 2008 by Dr Kai Kaye, who is a registered Plastic Surgery Consultant in Germany, Spain, and the UK. Dr Kaye regularly lectures at national and international conventions and teaches at Plastic Surgery Resident courses. Dr Kaye and his team also carry out charitable work, providing reconstructive surgery and dental work to patients in developing countries.